Once again, media outlets have had a difficult decision to make when it comes to censoring Charlie Hebdo's controversial depictions of the prophet Muhammad. In response to the Charlie Hebdo attack, many traditional media institutions chose to censor the controversial images that made the satirical French newspaper a target when reporting on this act of terrorism and the subsequent worldwide vigils that followed. For example, the Associated Press has removed images of Charlie Hebdo cartoons, leaving a cropped photo of slain editor Stephane Charbonnier holding up the newspaper as the only remaining image. 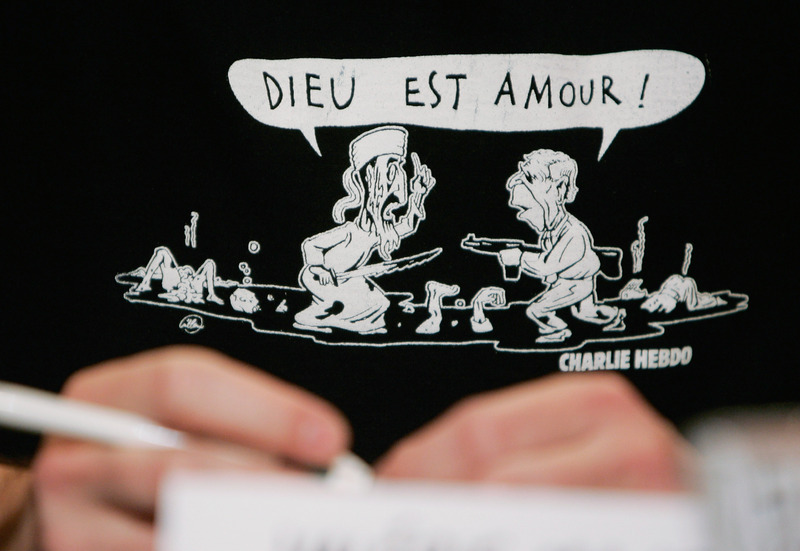 Another religiously offensive image entitled Piss Christ was also removed from their photo library, reports Gawker, who chose to show Charlie Hebdo cartoons on its site. Many newer media institutions have chosen to show the offending cartoons, including The Daily Beast and BuzzFeed, who went so far as to call out the Telegraph and the New York Daily News , among others, for their censorship. However, some traditional publications like the Washington Post have had a change of heart regarding Charlie Hebdo cartoons. Back in 2011, the paper published a piece on the Charlie Hebdo firebombing that merely linked to the offending cartoon in question. The Post has since gone so far as to physically print an image in the opinions section of its newspaper today and write about that decision. It may be mere coincidence that Amazon head honcho Jeff Bezos purchased the paper in 2013, but certainly Bezos and Co. are looking to be more digitally aware in melding their print publication with their online presence. Rather than clicking away to another site for the cartoon, or having to physically find a copy of the Washington Post, the newspaper combines the two and makes it easy to share. The social side of the story takes a particular focus in the digital world, where the term "page views" has been swapped for "readership." It's this contrast of digital and on-demand versus the more cautious meander of print that illustrates the differences in new and old media. Other examples of the new media and old media divide include a Financial Times' opinion columnist deriding the newspaper for not using "common sense," only to have his comments quietly edited to remove phrases referring to Charlie Hebdo as "not [a] convincing champion of the principle of freedom of speech." Meanwhile, new media heavy-hitter Slate released an image-heavy in-depth piece on Charlie Hebdo's controversial covers and their deeper meaning. This isn't the first time outlets have been tasked with such a decision. Coincidentally, it was Charlie Hebdo's support and reprinting of Danish newspaper Jyllands-Posten 's cartoons of the prophet Muhammed along with additional images of their own that gained them the most vocal support as well as opposition. For a satirical magazine that got its start by being banned by the interior minister when it started in 1969, it came as a bit of a shock at the time that so many would come to Charlie Hebdo's defense. French president Francois Hollande's testimony supporting free speech helped throw out the subsequent legal action taken against the newspaper by two Islamic groups in 2007.